I didn’t really understand the instructions for this exercise, but was advised by other students by email. I did a continuous line drawing of some objects on a window sill. Not sure if this was what was required, but used pencil, charcoal, conte pencils, ink pens. 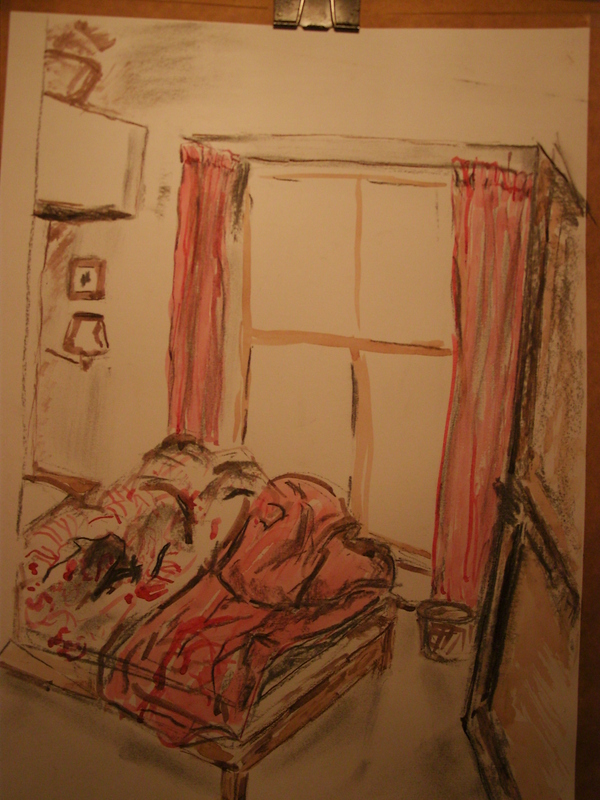 Then I stood in my bedroom door and drew with charcoal, adding ink mainly with a stick or brush. The result is very loose, suiting the appearance of the room which looks as if a bomb has hit it (as my mother would say). Exercise 4 Line and wash. Charcoal and ink. Later, I found a drawing by James Boswell (1949) Man in an Interior, which I copied in my sketchbook. It is a simple line drawing with a very small addition of red and terracotta watercolour wash. It is very effective in its simplicity. The perspective is not accurate. The table top and shelves are too flat, and there is little depth, but I like this inaccuracy, as I feel it is echoed by the roughness of the seated man, half off the page, with his cigarette between his fingers.